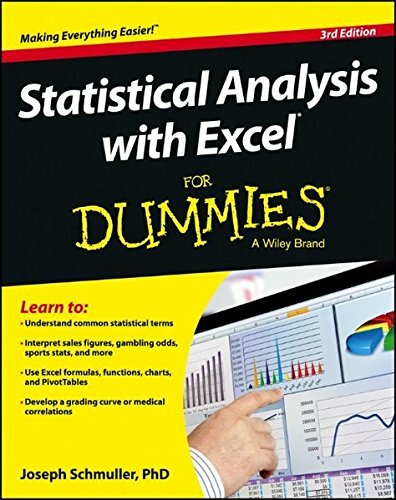 [PDF] Statistical Analysis with Excel For Dummies | Free eBooks Download - EBOOKEE! Description: Take the mystery out of statistical terms and put Excel to work! If you need to create and interpret statistics in business or classroom settings, this easy-to-use guide is just what you need. It shows you how to use Excel's powerful tools for statistical analysis, even if you've never taken a course in statistics. Learn the meaning of terms like mean and median, margin of error, standard deviation, and permutations, and discover how to interpret the statistics of everyday life. You'll learn to use Excel formulas, charts, PivotTables, and other tools to make sense of everything from sports stats to medical correlations. Statistics have a reputation for being challenging and math-intensive this friendly guide makes statistical analysis with Excel easy to understand Explains how to use Excel to crunch numbers and interpret the statistics of everyday life: sales figures, gambling odds, sports stats, a grading curve, and much more Covers formulas and functions, charts and PivotTables, samples and normal distributions, probabilities and related distributions, trends, and correlations Clarifies statistical terms such as median vs. mean, margin of error, standard deviation, correlations, and permutations Statistical Analysis with Excel For Dummies, 3rd Edition helps you make sense of statistics and use Excel's statistical analysis tools in your daily life. No comments for "[PDF] Statistical Analysis with Excel For Dummies".